Ski resort Alta Badia has its own ski conditions big advantage in that it is part of the Sella Ronda circuit, the local excellent pistes and deliver the perfect accommodations, also of shops, cafes, confectioneries, restaurants, bars and discos. Village town Alta Badia is Corvara in Badia. Apartments and residences are located in the town of Corvara (1,568 m ), near supermarkets, ski school, ski rental, pizzerias, restaurants, banks, shops and so on. Apartments can also provide other towns in the area of Alta Badia - Colfosco, Badia and La Villa / San Leonardo. Hotel Greif in alpine style, situated at an altitude of 1,568 meters. From the center of Corvara is located about 500 m. It was partially renovated and extended to a new part of wellness. Residence Salvan is conveniently located in the popular resort Alta Badia( Dolomiti Superski), about 400m from the center of Corvara. The beautiful surrounding mountain scenery of the Dolomites. Hotel Miramonti belonging to a network of hotels Domina Home is located in the popular town of Corvara Alta Badia ski area, one of the centers of the Sella Ronda. Hotel is about 500 meters from the center, surrounded by beautiful natural scenery. 1600 m altitude resort. Hotel Arkadia is located on the outskirts of the resort of Corvara, 100m from the center, in a quiet location but close to the lifts. Art Family run hotel with a long tradition Capella is located in the center of Corvara in Colfosco directly on the slope with a link to the Sella Ronda. The hotel includes two adjacent buildings dependance - Capella (80m) and Giovani Ciasa (opposite the hotel). Apartments and residences Fortuna are located in the popular town of La Villa in Alta Badia ski resort, which is part of the Dolomiti Superski with connection to the Sella Ronda. Astoria Residence is located in Alta Badia, a few minutes walk from the center of La Villa, at an altitude of 1,430 meters above sea level. The friendly, family-led hotel Pension Rez renovated in 2009 is located about 500 meters from the center of La Villa, about 5km from Corvara at an altitude of 1433 meters. Hotel La Villa residence was completely renovated in 2006, with the exception of the bar, which retains the traditional form. It is located a few meters from the center of La Villa in the famous ski resort of Alta Badia. Family run hotel Ladinia is perfectly situated in the heart of La Villa and just a few meters from the slopes in Alta Badia. It leads him Varallo family, former downhill skier, who started well for the national team at the Olympics in Sapporo in Congress. Sporthotel Teresa, built in traditional style located in Pedraces, at the foot of Sasso Santa Croce, 3 km from the center of La Villa and Corvara 8km from the center. The apartments are located in various residences in the resort Pedraces / San Leonardo. Nearby there are supermarkets, ski schools, ski rentals and ski shops and more than a pizzeria, restaurants, banks, boutiques. Family Hotel Cime Bianche is located in the heart of Alta Badia a quiet and sunny location, about 300 m (5 min. on foot) from the historic town center of San Cassiano. Resort altitude is 1.537 m.
Pleasant Mountain Ciasa Salares hotel with a cozy atmosphere is kept Wieser family since the 60s. The hotel is known for its cuisine and wine cellar. Ski resort Alta Badia is one of the best in the Dolomiti Superski, but also throughout Italy. Ski resort Alta Badia are regularly included in the FIS-world cup series. Alta Badia giant slalom organizes the most prestigious men in the world Cup. 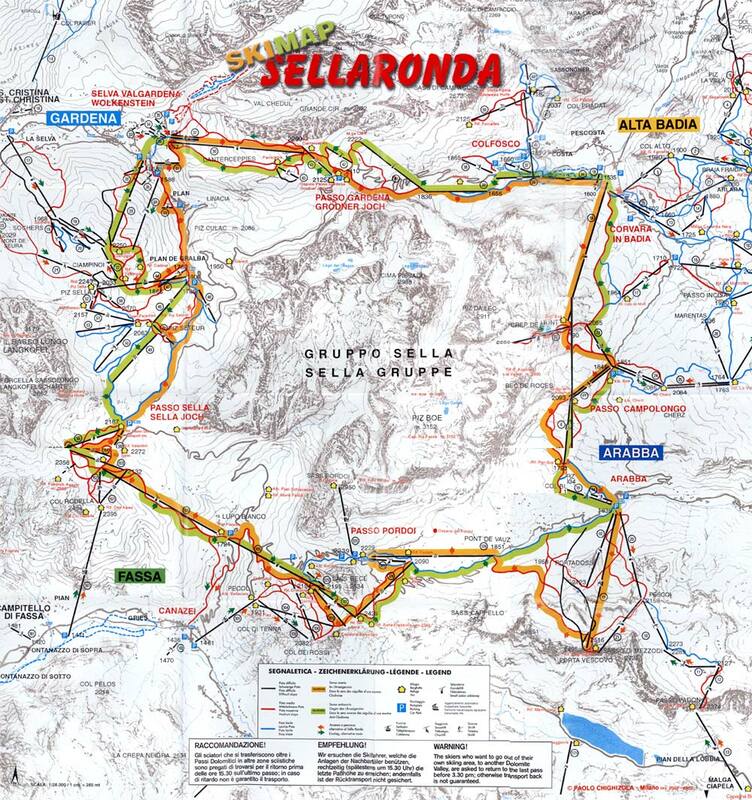 Around Alta Badia is located just a few interesting ski resorts - Arabba, Val Gardena, Val di Fassa, which are interconnected ski lifts around the Gruppo Sella massif and create the most famous Sella Ronda ski tour.